Grate cleaner: You whack and you scrape, but it’s never enough to remove those remaining shreds of citrus zest from your grater or microplane. If you’re a frequent zester, keep handy an old (clean!) toothbrush (or several) to clean your grater. You’ll find that toothbrushes are useful for other things, such as cleaning can-opener blades, as well. Rice is nice: Always save those stray bits of rice at the bottom of the bag. You need them to clean the bottom of skinny vases, jars and bottles. Simply pour a tablespoon or so of uncooked rice into your soiled bottle or vase. Add hot water and a drop of dish soap, and vigorously swirl and shake until clean. Moo juice renews: You wanted to have a fancy dinner party, but your best flatware is nothing but a box full of tarnished forks and knives. Got sour milk? Probably not. No fear! Here’s what to do…Take one tablespoon of white vinegar or lemon juice, and add enough milk to equal one cup of liquid. You’ve just made sour milk. Pour the sour milk in a glass pan, and soak the tarnished silver pieces in it for 30 minutes. Then wash the silver with soapy water, rinse and buff dry with a soft cloth. Your flatware should be tarnish-free. Sand outside the box: To remove heavy rust from your cast-iron cookware, mix sand (available at hardware stores, nurseries, pet shops…and the beach) with a few drops of vegetable oil to form a thick, gritty paste. Smear the paste on the rusty portions of the cast-iron pan, and scour with a nonabrasive sponge. When the rust is gone, wash the pan thoroughly, dry and reseason. 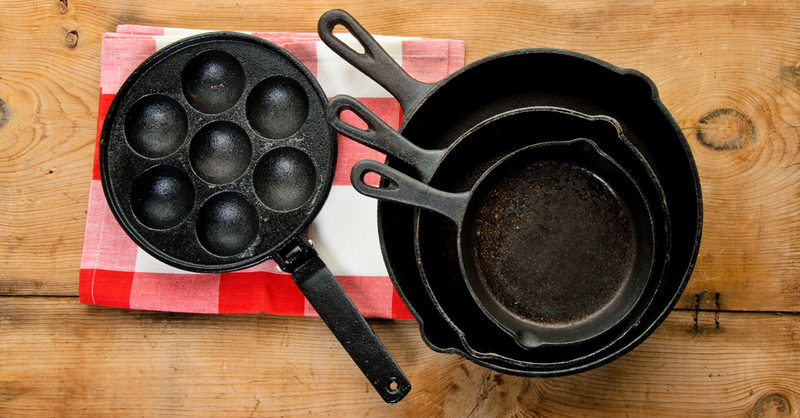 Store your cast-iron pan with a clean coffee filter or paper towel to keep the moisture away.